Do you love listening to your favourite tunes in your car? There's no doubt that listening to your favourite music while driving can instantly put you in a good mood. And music can also help our bodies relax physically and mentally to relieve. As one of the most popular streaming music services, Apple Music has been adopted by more and more people in the world. It is packed with features: stream on-demand any track from the iTunes catalogue for offline listening, and access all your music - even songs ripped from a CD. Apple Music also offers up radio stations, social ties, and integration with Siri - so you can control most things with voice commands. 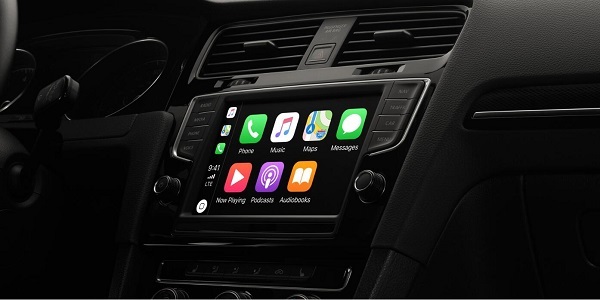 If you are looking for a way to enjoy your Apple Music songs in the car, we will introduce several effective methods to help you play Apple Music tracks in your car. As we all know, Apple Music is available on the iPhone, iPad, and iPod touch; on Macs and PCs running iTunes; on Android; and on the Apple TV. However, Apple Music is not compatible with car stereo directly. Don't worry, you can play Apple Music in the car with your iPhone in several other ways. CarPlay is a smarter, safer way to use your iPhone in the car. If your car supports CarPlay using the USB port, plug your iPhone into the USB port of your car or stereo. The USB port might be labeled with a CarPlay icon or a smartphone icon. If your car supports wireless CarPlay, press and hold the Voice Control button on your steering wheel to set up CarPlay. Or make sure that your car is in wireless or Bluetooth pairing mode. Then on your iPhone, go to Settings > General > CarPlay > Available Cars and choose your car. You can choose to connect iPhone with your car using Bluetooth. Just go to Settings > Bluetooth to turn Bluetooth on. Then check your car stereo's user manual for how to pair with a Bluetooth device. Most cars require a phone setup on the car display. Once your iPhone paired with your car successfully, you can open Apple Music app and select the tracks to play. If your car don't support CarPlay, you can play Apple Music songs in your car via Aux input. Simply connect iPhone to the car sound system with an Aux cable. Now you can go to play Apple Music on your iPhone, and the music will start to play though the car audio player. We can enjoy Apple Music tracks playability in the car stereo from multiple sources like AUX, Bluetooth, CarPlay by using iPhone. But all the music need to be played within Apple Music app because of Fairplay DRM protection. What was worse, when you cancel your Apple Music subscription, all that streaming songs are unavailable. But don't worry, there's a perfectly DRM removal program called Sidify Apple Music Converter coming to help you. It can not only remove DRM from Apple Music songs, but also can convert them to unprotected audio formats including MP3, AAC, WAV and FLAC. In that case, you can transfer the converted Apple Music songs to USB drive and play them in your car freely. Now, you can follow the detailed tutorial to get rid of DRM protection from Apple Music songs and convert them to USB supported audio formats such as MP3. And then you can transfer those DRM-free Apple Music files to USB drive for playing in your car. Sidify Apple Music Converter is available for Mac and Windows operating systems. Here we will take its Windows version as example. Download and install the free version of Sidify Apple Music Converter on your PC in advance. Double click to launch Sidify from your desktop and the main interface will show up automatically. In order to add Apple Music files to the program, you can click + button at the bottom-left corner of the main interface. And you can select one or more files from the pop-up iTunes library window, then hit OK.
Click settings gear icon to open a new Settings window, in which you can see the whole format list and choose the suitable audio format as you need. We'd recommend you choose the output format as MP3 which is the common audio format we used most. Simply click Convert to start the Apple Music to MP3 conversion process. After the conversion, you can find the converted DRM-free Apple Music files in the history folder. Plug the USB drive into your computer, then drag and drop the converted Apple Music songs to the USB. And you can insert the USB to the USB port of your car stereo system, now you can start playing the converted Apple Music songs in your car at will.